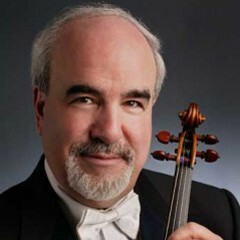 After more than three decades of service as concertmaster of the New York Philharmonic, Glenn Dicterow joins the faculty of the USC Thornton School of Music in 2013 as the first holder of the Robert Mann Chair in Strings and Chamber Music, forging a new chapter in a distinguished, multifaceted career. Dicterow made his debut in 1960, at age 11, as soloist with the Los Angeles Philharmonic in the Tchaikovsky Violin Concerto, his New York Philharmonic debut following seven years later, again performing the Tchaikovsky Concerto. He became associate concertmaster of the Los Angeles Philharmonic in 1970, joining his father, Harold Dicterow, the principal second violinist of that orchestra. He rose to the position of concertmaster three years later. Dicterow came to the New York Philharmonic in 1980, serving as concertmaster under four music directors, Zubin Mehta, Kurt Masur, Lorin Maazel, and Alan Gilbert. Beside his first chair duties, Dicterow performed as soloist with the New York Philharmonic annually, his renditions of Mozart, Brahms, Bruch and Bartok balanced by more recent concerti by Korngold, Rózsa and Szymanowski, plus contemporary compositions such as Aaron Jay Kernis’s Lament and Prayer and Karel Husa’s Violin Concerto. Highlights include the orchestra’s 1982 performance at the White House with Dicterow as soloist, a 1986 tour performing Leonard Bernstein’s Serenade After Plato’s “Symposium,” under the composer’s baton, and a 1990 performance of Waxman’s Carmen Fantasy, after Bizet, led by Zubin Mehta and shown on a PBS Live From Lincoln Center telecast. Dicterow has participated in such leading chamber music festivals as those of Santa Fe, Seattle and Bowdoin, among many others. He is also a founding member of the Lyric Piano Quartet and the Amerigo Trio. His wide discography includes two separate New York Philharmonic recordings of Scheherazade, one led by Kurt Masur, the second by Yuri Temirkanov. His New York Legends recital includes the premiere recording of Bernstein’s Sonata For Violin and Piano, while his recording of Mozart’s Sinfonia Concertante, in collaboration with violist Karen Dreyfus and the Warsaw National Philharmonic Orchestra, is paired with William Thomas McKinley’s Concert Variations, written expressly for those forces. His music making extends to performing solos in the scores of such movies as The Turning Point, Altered States, Aladdin, Beauty and the Beast, and Interview With the Vampire. The recipient of the Bronze Medal in Moscow’s International Tchaikovsky Competition of 1970, Glenn Dicterow studied under the tutelage of Erno Neufeld, Eudice Shapiro, Naoum Blinder, Manuel Compinsky, Henryk Szeryng and Jascha Heifetz. He received his B.A. in Music from the Juilliard School, where he was mentored by Ivan Galamian, years later serving on the Juilliard faculty himself. Beside his ongoing dedication to master classes, from Austin, Texas and Aspen to North Korea and Vietnam, Dicterow has chaired the innovative Orchestral Performance Program at the Manhattan School of Music for two decades. Mr. Dicterow is now also a Faculty Artist at the Music Academy of the West, following three years of participation in Music Academy Summer Festivals.